In 2013, the University of Canberra was ranked in the top five per cent of universities in the world by the QS World University Rankings. It offers over 200 undergraduate, postgraduate and research degrees across 28 specialty disciplines from business, government and law to arts and design. The university designs its degrees to enable students to create their own career pathways, including flexible learning options and hands-on work experience. 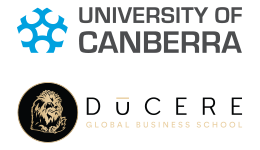 The University of Canberra is a provider of online courses for Ducere.